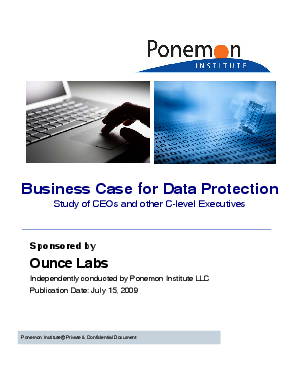 The Business Case for Data Protection, conducted by Ponemon Institute and sponsored by Ounce Labs, is the first study to determine what senior executives think about the value proposition of corporate data protection efforts within their organizations. In times of shrinking budgets, it is important for those individuals charged with managing a data protection program to understand how key decision makers in organizations perceive the importance of safeguarding sensitive and confidential information. The research focused on how aware CEOs and other senior executives are about their organization's data protection efforts, what they believe is the economic justification for investment in a data protection program, how data protection programs support organizational goals, how effective they think their data protection leader is at using objective measures to justify spending and what objective measures should be used.